Velodyne CHT-8Q review | What Hi-Fi? 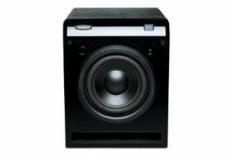 Velodyne has been working hard to maximise the competitiveness of its affordable subwoofer range. To that end, the new CHT-Q line-up (available in drive-unit sizes from 20cm up to 38cm) includes digital power amplification, coupled to impressive onboard DSP (digital signal processing). Together with a microphone-based automatic calibration system, this is designed to ensure an optimised sound regardless of your system and your room's acoustic properties. Combined with a remote control and an LED display, the result is a subwoofer anyone can configure in moments – and as proper configuration is 90 per cent of the battle of setting up any subwoofer, that's an asset that really shouldn't be underestimated. The CHT-8Q belies its status as the baby of the range with 180W of output and a gutsy, potent sound: for many real-world rooms, its bass will be more than adequate, especially since the Velodyne's relative agility makes it more suited to music use than some of its forebears. True, a B&W ASW610 is faster still, but for outright stomp – and for ease of use – this Velodyne more than merits a five star rating.